Ants can be a huge problem. Black ants and oil ants often invade homes, covering everything in their path with a moving black carpet of tiny bodies. They can find their way into even the smallest cracks, allowing them to invade virtually any space. 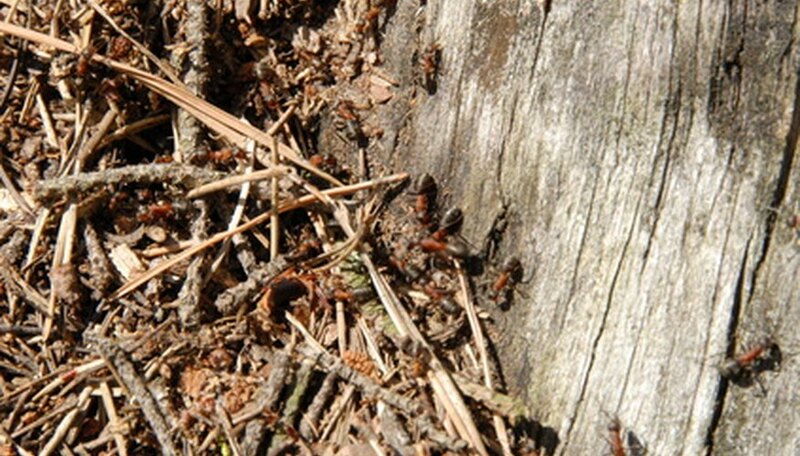 California red ants generally remain outdoors, but once they've taken over a garden it is difficult to do any gardening without being bitten. Red ant bites can be painful and even deadly for individuals who are allergic to them. Getting rid of ants as fast as possible is the best solution to your ant problem, and the use of agricultural lime is one of the quickest, easiest solutions. Lime does not kill ants, but causes them to abandon their colonies and move elsewhere. Buy at least 20 pounds of agricultural lime. Agricultural lime can be purchased at most feed and grain stores and is often available at nurseries and home centers as well. Put on gloves, eye protection and a breathing mask before opening your lime powder. Shovel a small amount of lime (as much as you can easily carry) into a bucket. Grab a handful of lime at a time from your bucket (wearing gloves) and shake your hand back and forth, spreading a three-foot-wide line of lime between the ant hill and your home. Refill the bucket with lime as needed. Slowly move toward the ant hill, spreading the remaining lime. Spread the last bit of your lime directly on the ant hill. Wait three days and recheck the ant hill. The ants should be gone by this time. If the ant hill is still active, purchase another 20-pound bag of lime and repeat the process one time. If the ants have not abandoned their colony within three days, you must try other measures to rid yourself of your ant problem. . In most cases, one application of lime per season around your home should be enough to keep out all ants, including new colonies that form after you have gotten rid of the initial colony. However, heavy rains or irrigation could weaken the effect of your lime as the season progresses, making it necessary to lime a second time if new colonies form after the first colony is abandoned. Always wear eye protection and a breathing mask when using powdered lime.